3 Startup Mistakes: What do young startups focus on besides their metrics? Early Stage Founders have a massive amount of things to do. As they progress in their startup, their days feel shorter and shorter. I found that a lot of them put a surprising amount of effort into things in the medium and long term instead of focusing on the now. When I ask them about what metrics they are currently looking at, what is important to them, etc.. it is surprising the range of answers they gave. This article will go through some of the most common 3 examples of early stage startup mistakes and how focusing on their metrics can bring them back to reality. Keep in mind that we are just focusing on early stage startups who have recently started building their new business. People will always recommend you to read this startup book or learn the newest marketing tactics to “hack” your way to the top. This is not to discourage you from learning but your experience through your actions will dictate how much you will learn more than any amount of reading can. Someone else’s best practice for marketing strategy, channel distribution, and business negotiation may not be yours. Since every business is so unique, you will never know what your best practice is until you go out there and try it out for your business. I personally love learning about social media marketing, as it is an extension to my online marketing background. I usually take Saturdays to learn new things. To reach our target audience of startup companies, I actively try out every social channel to see where our audience is most engaged and active. I execute educational videos, live stream, and blogs on Youtube, Facebook, LinkedIn, Instagram, Twitter, and Medium. On a daily basis, I track to see which channels perform the best in order to decide where to invest our future marketing investment. Founders are getting pulled in every direction these days due to many sources of influence whether that be from buzz going on at startup events, feedback from friends and family, or referrals to potential partnerships or “you know who would be great for you to talk to?” I bet you can think of some examples! It is unwise to focus your energy on partnerships for medium-long term instead of focusing on upcoming pilot project or trial. Example: Don’t wait to hire the perfect person to help run your pilot project or beta test instead of dong it yourself. You can learn so much more from that experience. ACTION ITEM: Mark future tasks for 1–3 months from now. If you can quickly identify tasks or budding partnerships that should be implemented in a month then set that in your calendar to start 1 month from now. You don’t have to do everything at once and become overwhelmed because there are too many things in your plate. When these things start to pile on, a plate of opportunities can easily start to look like a plate of distractions. A practical thing to do is to pace yourself. If there is a new resource or future channel to explore, then put it off until you have completed what is important now such as making your first pilot project a huge success! How can startups get that cure if their customers are not the forefront of their attention? a) Customer Discovery: Some early stage entrepreneurs go through cycles of procrastination before doing any kind of market research or product market fit surveying. Many first time startups will explain how they feel their product is not ready to show or they fear competition. (It will guide you through all the basic steps with concrete examples.) If you want a template of survey questions, send me an email and I can send you one! As human beings, we do things we want to do and not the things we are supposed to do. If it easier to for some to work creating a nice website rather than get feedback from their customers, you bet they will mainly put their efforts into option #1. ACTION ITEM: Schedule appointments with your customers to get feedback on a regularly basis. Try to schedule them in advance. Even if you have new distractions such as startup events, hiring new team members, etc..you will ensure that your regular meetings will make sure that you are always in touch with your customers and you are not avoiding them. To get startup feedback for VenturX’s product releases, I schedule Skype calls every 3 weeks with startup friends to show them the revamp and get their feedback. I also contact 1 startup about his VenturX Metrics every single afternoon between 2pm-4pm. He said he preferred SMS notifications. To show love, I send those individual daily reports from my phone. What Metrics Should I Concentrate on? Did you find out what stage you are in? Can you see which metric is the most important? Now you can reverse-engineer the formula to get rid of those 3 startup mistakes for early stage entrepreneurs! Keep in mind that even though this article was mainly from our observations with early stage, first time entrepreneurs, there may still be more information to come! There may also be more than 1 metric that will yield a red flag such as low product market fit and finances. As someone who studies startups, I wanted to share with you my learnings about this fascinating industry. I hope that with this simple guide, your early stages in your company will go much smoother! If you have any questions about your metrics, send me an email at sydney.wong@venturx.ca and let’s take a look together! With all the buzzwords surrounding entrepreneurship like venture capital, acceleration, growth hacking, etc., there is always one phrase that stumps most entrepreneurs in their track! PRODUCT MARKET FIT! This topic was fascinating to me to the point where I have been researching it since 2016 and built a startup tool to measure it. That was how VenturX was created, a startup that focuses on leveraging data to help early stage startups get from product market fit to funding. We focus on the most important KPIs for young companies such as product market fit. At VenturX, we’re creating tools to help early-stage startups succeed; the first thing we always suggest is assessing the product-market fit. Not only is it the number one reason why startups fail (according to a report by CBInsights), but also the hardest to achieve because it can seem daunting to collect all the data in order to prove that their idea addresses a real need. The initial assessment of product market fit doesn’t necessarily require huge amounts of time or money. In this post, we’ll lay out four straightforward steps that you can follow to get a solid first look at how well your idea fits a market need. What exactly is product market fit? If you don’t know where to start, ask yourself who are you selling to and who needs your product/service? From researching entrepreneurs for the past year, I learned that the hardest step is surveying those first 5 customers. To do it in 24 hours, can you find an event or location where your target audience happens to be? Remember you are doing research and not selling to them. Example: For VenturX, part of my target audience is venture capital investors. I knew that they could often be found at startup competitions where they serve as judges. I knew that attending an event like this would be ideal to get the most amount of research done in 24 hours. Tip: Not everyone likes talking to strangers, so why not bring a friend who LOVES it!! If you are in Montreal, send me a message or comment below and I’ll take the first 5 people to go surveying for their startups! I asked multiple startups how they were currently researching product market fit and they all told me they input information into a spreadsheet and never used it again. Their issue was that they were collecting only qualitative information and had no way of comparing answers. If they had quantitative information, they would be able to compare the target market’s level of pain and benefit. The solution? Rather than asking purely open-ended questions like “What do you think of this idea?” get them to describe the pain your idea addresses and the benefit it provides and asks participants to rate them on a numerical scale. Here’s an example of how your survey might look. If you’d like a copy of the survey, shoot an email to sydney.wong@venturx.ca with the subject line “Product Market Fit Survey” and I’ll send it your way. Example of Pain: Startups who are not ready for funding take up a lot of the investors’ time with everything from initial pitches to due diligence and follow-ups. Investors often end up telling these startups to keep in touch, that it is not a good fit at this time, or to come back later. Example of Benefit: What if you had a solution that would replace your current application process and cut your due diligence in half? You would see the best startups who have reached their product market fit level and score higher than their industry benchmarks. TIP: Always ask about the pain before the benefit. If you only talk about your solution, it is no longer research, but rather a sales pitch! TIP: If you are unsure of your pain and benefit statements and only have limited time at one event to get all those responses, then bring two different pain and benefit statements, and compare responses to both. Currently, most startups are manually tracking their answers on a spreadsheet. The benefit of spreadsheet tools is that it’s familiar, and you can manually create graphs from the data and present them to your team. Another option is to use the startup tool that we’ve created at VenturX, that takes in your survey data and automatically calculates a product market fit score. It takes 30 secs to get a score like the one below! You can try it out at www.venturx.ca. TIP: Do not let your target audience see other people’s answers or else it might influence their answers too. It is normal that you do not get a lot of 9’s and 10’s on your first iteration, but the important thing is to stay consistent. Do not change your pain or benefit statement after just a few responses. (You’ll know that you are on the right track when you consistently get high scores (9’s or 10’s) when you survey. Example: I had to narrow my target market to only early stage venture capitalists, rather than all VCs. If I expand my product with more features, I will have to rinse and repeat this process all over again with a new product market fit survey for a new audience! Once you’ve completed these steps, take a step back and look at your results. Whether your scores are low or high, you’ve certainly achieved something. You now have a quantified score that either validates your idea or tells to you to try a different target market or tweak your angle. Either way, stay strong, motivated, and persistent, and keep on quantifying! Our team had an amazing opportunity to shadow Shayne Morten, Founder of Flexiship, for a few days. 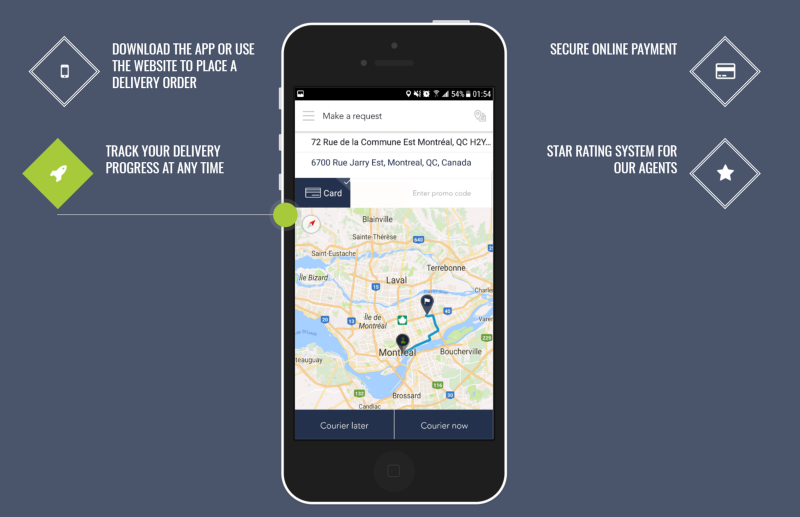 Flexiship is an on-demand delivery service in Montreal! We posted about Shayne’s tips and trick for lead generation, sales, and much more! To see these videos, check out our Facebook page. Flexiship is an on-demand delivery app you will no longer have that problem. With the Flexiship on-demand delivery service you can get your packages immediately! It allows you to request any type of delivery to be picked up and dropped whenever and wherever you need it. As soon as an agent accepts your order, you will be able to track the progress of your delivery until completion. It’s that easy! Flexiship is at Your Service! What is founder Shayne Morten’s background? Shayne used to be a racecar driver who sold ad space on racecars to corporations for sponsorship. This on the field training gave him the drive and sales experiences to turbo charge his startup. Shayne Morten is a graduate from Defi Montreal in 2017 where he learned traditional business process. Since then he has done business on the product side, team management side, sales side at the same time. As a sales focused entrepreneur, we can easily see how his actions affect his success metrics. Check out his scores below. What does a typical week look like for this founder? We got some great sales inspiration from Shayne, like what do you if a lead already uses your competitor. Clearly Shayne knows how to hustle! Contact Shayne Morten at Shayne@Flexiship.ca or on Linkedin, and check out Flexiship at www.flexiship.ca.